SCHOOL SHOOTING MAP MAY BE A HEXAGRAM EXTENDING FROM CANADA TO THE TIP OF SOUTH AMERICA! THE CENTRAL POINT IS HOPE, ARKANSAS! Title: SCHOOL SHOOTING MAP MAY BE A HEXAGRAM EXTENDING FROM CANADA TO THE TIP OF SOUTH AMERICA! THE NORTH CENTRAL POINT IS HOPE, ARKANSAS! Subtitle: In NEWS1344, we showed you a map gotten off a website bulletin board frequented by a former Satanist that depicted six of the school shootings as being located along two lines intersecting in Hope, Arkansas. The 120-degree angles were intriguing to us, as they suggested a Satanic hexagram. We have now confirmed this likelihood, suggesting Black Magick is being used at highest levels of the Clinton Administration. In NEWS1344 , we broke the story of the School Shootings Map we had discovered on a bulletin board frequented by this former Satanist. We discovered, to our horror, that three horrific school shootings have occurred along each of the intersecting lines, for a total of six (6). These two intersecting lines crossed in Hope, Arkansas, famous only because President Clinton grew up there. This map suggested to us that these school shootings were planned events , with the purpose of convincing enough Americans that guns are an evil that needs to be dealt with severely, thus allowing the Federal Government to achieve its Illuminist goal of seizing all weapons. We firmly believe this to be true, as the Illuminati understands it cannot bring its vaunted New World Order into being until they seize all privately-held arms. The former Satanist who discovered this map told us that he thought these two intersecting lines were the middle lines that would form a Goatshead of Mendez. While this seemed intriguing, the angles were not right so we postulated that these lines might be the two horns of the Baphomet Goat. Then, we realized that Littleton, Colorado, was about 85 miles off the line, as drawn straight from Eugene, Oregon, to Perl, Mississippi. We concluded this meant the line was at least geographically 85 miles wide, rather than being just pencil width on a map. If these were true, then Waco was along the Northeast-to-Southwest line, and Oklahoma City was along the Northwest-to-Southeast line. This discovery just led further credence to an already mounting body of evidence that both Waco and Oklahoma City bombing were planned and carried out by the Illuminist Government of President Clinton. Then, a few weeks ago, Pastor Ron Riffe, who writes articles for the Pastor's Heart section of The Cutting Edge Ministries , suddenly received the inspiration to study these intersecting lines using his old college training in Engineering Drawing. He dug out his old mechanical engineering tools, blew the dust off them, and went to work extending out these two intersecting lines, keeping the angles the same as on the original map. Last week, Ron called me to breathlessly inform me that he had concluded that we have a hexagram here, one that is mighty big. "In my brief youthful fling with the idea of becoming a mechanical engineer, I had a year and a half (3 semesters) of Engineering Drawing at the University of Alabama. This included, of course, the drafting of mechanical parts--utilizing drafting board, tee-square, compasses, dividers, architect's scales, etc. I have also done some house plans." "The basis for the enlarged drawing is found in the 120 degree angle formed by a line drawn from Springfield, Oregon to Hope, Arkansas--and then from Hope to Edenboro, Pennsylvania, which winds up being shorter in overall length. The line from Hope to Edenboro is then extended to the same length as that of Springfield to Hope in order to maintain proper symmetry. (Actual mileage is not important). Once these two base lines are drawn and the angle of their intersection is determined, the rest is just a matter of extending lines and maintaining proper lengths to form the "star" tips. The 120 degree angle automatically designates it as a hexagram, whereas 110 degrees would result in a pentagram. Of course the overall hexagram could be enlarged indefinitely by extending the lines far beyond Springfield and Edenboro, but this would not change the angle of intersection or the fact that all of the various cities are along, or very near, the two base lines. The entire figure is pre-determined by the angle between the two base lines and the accuracy is fairly precise." Thus, you can draw a hexagram on your flat map at home to duplicate what we have drawn here. We really want you to calculate these six points and then draw the lines to connect them, because of the material we present in the article following, NEWS1351. You will begin to then understand how important this hexagram is to the Illuminist occultists running our government and operating the HAARP array to control our weather. And, remember that the key northern intersection is in Hope, Arkansas, clearly telling us that this entire episode begins and ends with President Clinton. We realized that we were dealing with issues far more important than Gun Control in the United States. We believe the school shooting parts of this hexagram intersecting at Hope, Arkansas, are primarily designed to inflame Americans against guns. Not only do the school shootings carry this theme, but Waco and Oklahoma City bombing carry this theme also. After Oklahoma City, we heard many news stories concerning the guns that the Far Right Wing had amassed, and many news stories about the "threat" posed by armed militias. Gun Control, Gun Control, and more propaganda against Gun Control. The episodes in Waco also carried the theme of the threat supposedly posed by American "Religious Fanatics of the Far Right Wing", as we detailed in NEWS1347. DISASTERS ACCORDING TO THIS HEXAGRAM?! We believe it likely that many disasters involving the Weather plus other major disasters may have been planned to occur according to this hexagram. Let us give you some examples and let you make up your own mind. Remember, the Littleton, Colorado [Columbine High School] shooting was 85 miles off the line, telling us that these lines are at least 85 miles wide. 1. The huge flooding in Venezuela is precisely on the line running from Nova Scotia to the point off Mar del Plata off the Brazil coast! Venezuela is located 8 degrees North and 66 degrees West, according to the CIA Factbook. As we show in the map of NEWS1351, the flooding is located precisely on this line of the hexagram. Is this coincidence? You can make up your own mind. 2. Each USA line intersecting at Hope, Arkansas, has three (3) school shootings, for a total of six school shootings. Read NEWS1344 for full details. 3. Waco, Texas, disaster occurred right on the line running from Nova Scotia to the point in the Pacific Ocean [5 degrees South to 148 degrees West]. We discuss this planned disaster in NEWS1347. 4. Oklahoma City bombing occurred right on the line running from Eugene, Oregon, through Hope and out to the point in the Atlantic Ocean. 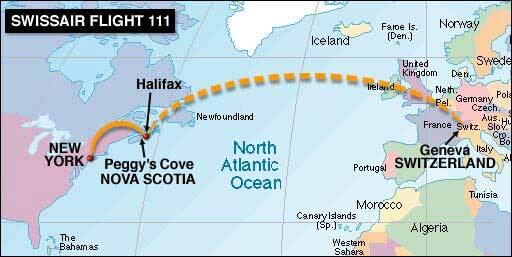 Swissair Flight #111 went down at Penny's Cove, Nova Scotia, [East of Halifax] along the line. It may be that both the northernmost points are bathed in blood. 6. John F. Kennedy, Junior's plane went down 20 miles from Martha's Vineyard, just inside the line running south from the point in Nova Scotia. While his plane apparently did not go down right on the line, it went down close enough to it to raise one's eyebrows. Nevertheless, his plane did go down in the northernmost triangle formed from Hope, Arkansas, to Nova Scotia, and over to just north of the San Juan Islands where it intersects with the line running from Eugene, Oregon. We will call this particular triangle within the hexagram as Triangle #1. 7. EgyptAir Flight 990 crashed specifically on Halloween, 10/31/99, just 25 miles from where Kennedy's plan went down. Thus, this crash is also very close to the line running from Nova Scotia to the San Juan Islands, and inside Triangle #1. Remember, the lines are at least 85 miles wide. 8. TWA Flight 800 crashed just 8 miles off East Moriches, Long Island, New York. The crash scene is not anywhere near the line, but plainly within Triangle #1. 10. Jon Benet Ramsey was murdered in Boulder, Colorado, along the same line as the Columbine High School shootings. We have all wondered why the police have never been able -- or willing -- to solve this murder, after three long years. But, if Ramsey was murdered as part of a witchcraft ceremony or as part of this overall Illuminist conspiracy to produce the New World Order, you would expect the case to never be solved. Witchcraft has long ago penetrated into the highest levels of Federal, State, and even Local, governments, including some police departments. One site who carries occult material such as online Tarot and Horosscopes is even calling Jon Benet Ramsey's murder a "sacrifice" [http://www.sollog.com/lineofsollog.shtml] The major difference of The Cutting Edge Ministry is that we examine events from the occult perspective, because so many events are caused by the occult plan of the New World Order. 11. Gianni Versace was murdered in Miami on July 15, 1997. Miami is right on the Northwest-to-Southeast line. Sollog is claiming this murder was part of the plan to create events that would occur along this magical set of lines, lines we know now are part of a huge hexagram. Remember, true Satanists hate homsexuality and lesbianism because such sexual activity does not practice the Bi-sexuality considered pure and perfect, reflecting the belief that all of Nature operates according to the principle of Duality. This fact is the reason Hitler turned on his loyal Brown Shirts even after they had been mightily responsible for his rise to power; the Brown Shirts were primarily homosexual. Over 10,000 of them died over a weekend in a slaughter now called "The Night of the Long Knives". 12. On December 31, 1999, five people died in a hotel shooting spree in Tampa, Florida. Sollog claims this crime was part of these tragedies planned to occur along one of these two lines. [http://www.theeunderground.com/cgi-bin/sollog.cgi?read=21 ] Certainly, Tampa is along the line running Northwest to Southeast. The date of this tragedy is significant because a Satanist considers a "31" to be a reversed "13", Satan's favorite number. 13. School Shooting in Fort Gibson, Oklahoma, lies along the Northwest-to-Southeast line. While this shooting did not result in the death of any students, it seems to fit the overall pattern of disasters planned to occur along this line. WHY DOES THE ILLUMINATI PLAN DISASTERS TO OCCUR ALONG A SPECIFIC LINE? You must understand the thinking of Black Magick Satanism to understand why the Illuminati might create a huge hexagram like the one we have drawn above, and then cause disasters to occur along that line. We encourage you to study the "I Witch" symbol below as we share with you why the Illuminati would create this scenario. Why was this unbelievable symbol created in the street layout of Government Center? The Satanist believes that, once a magical symbol -- defined as cunningly hiding an inner meaning -- is drawn, it begins to reverberate with occult power. When such a symbol is drawn on the ground -- which witches do all the time -- that symbol begins to reverberate with occult power, 24 hours per day, 7 days a week. Thus they believe they are calling forth the power of Satan to aid them in accomplishing their goals. As you study the "I Witch" symbol, below, you can see that the Illuminati believes their goal can be reached only with the spilling of human blood in huge proportions. Casualties in war count, as does murder, suicide, abortion, infanticide, and "accidents". Many "accidents" are really Psychic Murder, in which a killing ritual is performed, calling a demon into the 9-foot circle, into which a hexagram has been drawn. Once the demon has manifested himself into this dimension, the witch tells him he is to kill an enemy of the coven, or a traitor, or just someone who needs to die. Once the witch gives the demon the name and address of the victim, the demon disappears back into his dimension and will carry out the murder as directed, usually very soon. The police are always baffled by this type murder, because no human committed it directly, and there are no clues left behind that would tie the murder into any individual. When I first met Doc Marquis, he was conducting seminars with homicide detectives of the Boston Police Department to enable them to understand when they were dealing with a murder committed by a Satanist, and when they were dealing with Psychic Murder. Police Departments will waste none of their precious time and resources trying to solve a murder once they determine it was committed by a demon. Yet, the Satanist knows who committed the deed, and they count the death as a proper sacrifice. Thus, it is highly conceivable that the Illuminati would create such a symbol, believing it would reverberate with Satanic power to aid them in achieving their global objectives. Certainly, we have a great number of "coincidences" to consider, as too many disasters of one sort or another have occurred along, or on, these lines of the hexagram. DOES THE ILLUMINATI HEXAGRAM FIT INSIDE THIS HEXAGRAM? In previous articles, and in Seminar 2, we detail this Illuminati symbol as to how they are going to achieve the New World Order. We believe this symbol may be the most complete, and the most important, symbol as to all the forces working together to bring about the New World Order Kingdom of the Antichrist. Rather than explain it to you in depth here, please click on https://www.cuttingedge.org/pages/seminar2/SEAL8.htm to see the full explanation of this symbol; then, come back to this article for further detail. Notice the upper point of this Illuminati Hexagram, the one with the circle of the Illuminati (Moriah) above it. This is known as Triangle #1, and is easily the most important triangle of the six in the hexagram. This triangle represents the seat of the Illuminati, and is clearly the most powerful point, as evidenced by the fact that the sacrificial blood from the witchcraft practiced by the Illuminati is pouring only over and on top of this Triangle #1. After all, Washington, D.C., is located within this Triangle #1, and we have proven over and over how visibly occultic and given over to Satan it is, down to the point of the occult and Freemason symbols formed by the streets in Government Center [Read NEWS1040, for full details]. 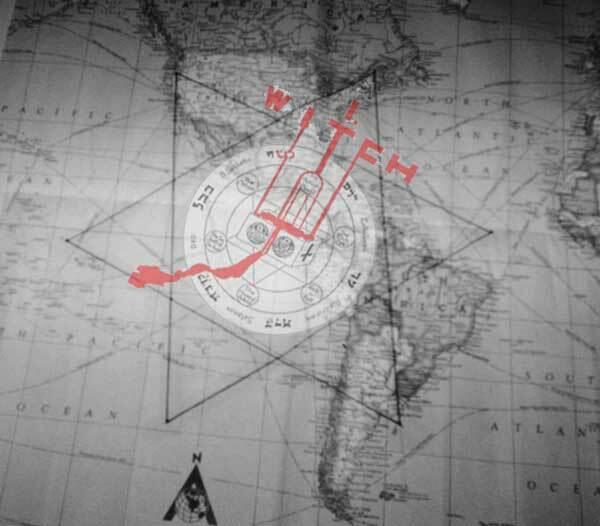 We have superimposed this most important "I Witch" symbol over the hexagram map, making sure that the area of Triangle #1 is located over the triangle formed by the lines flowing from Hope, Arkansas, northward to Nova Scotia, and southward to the intersecting point just north of San Juan Islands. We find it highly instructive that so much has occurred around or on the three lines forming Triangle #1. The key decisions of the Clinton Administration clearly have occurred within the Illuminati Triangle #1. President Clinton has demonstrated more evidences of active witchcraft than any President in history, which we detail in "Clinton's Fatal Leadership" series at the top of our Home Page. If you have not read these articles yet, we highly encourage you to do so now. President Clinton has conducted the most bloody administration in history, has been the most corrupt, has been the source of the most Antichristian decisions in history, and has been the most visibly Illuminati President we have ever had to endure. Clinton is also the leader of Nation #1 in the global 10-Nation Reorganization Plan, which places him in Daniel's prophecy of the 10 Kings [Daniel 7:7; 7:20-24]. Read NEWS1205, "Is Clinton Found In Prophecy" for full details. 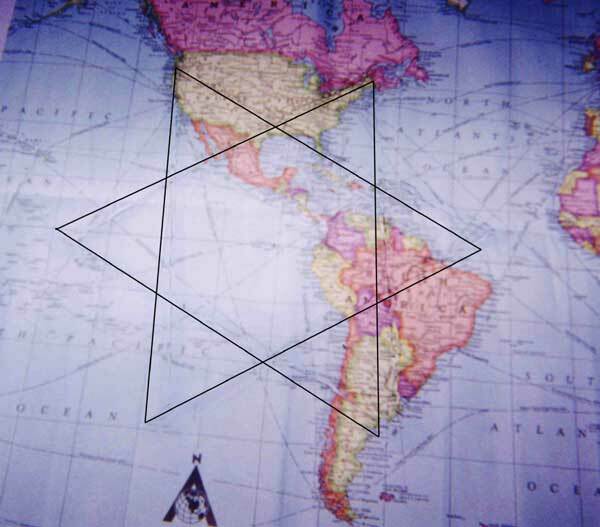 Finally, notice that the middle of this hexagram -- where the global Satanic altar is located -- contains the Galapagos Islands. Of course, these islands were the ones at which Darwin conceived his Satanic idea we now call Evolution. Certainly, the teaching of Evolution rather than Biblical Creationism is a key spiritual element in the Illuminist plan to achieve their New World Order. Thus, we find it interesting that these islands may form the Satanic altar of this particular "I Witch" symbol on this map. "... there are 360 degrees in a circle and since there are four lines that emanate from Hope, Arkansas, you would divide that by 4 to say that the odds that one event would fall on any of these four lines would be equal to 1 in 90. Two events would be 1 in 8,100; three events would be 1 in 729,000 against; the odds that eight events would fall on any one of four lines emanating from Hope, Arkansas are actually 1 in 4,304,672,100,000 against it being accidental. That is over 1 in 4.3 trillion against these events happening accidentally." I think we have established, beyond reasonable doubt, that these events are planned events. 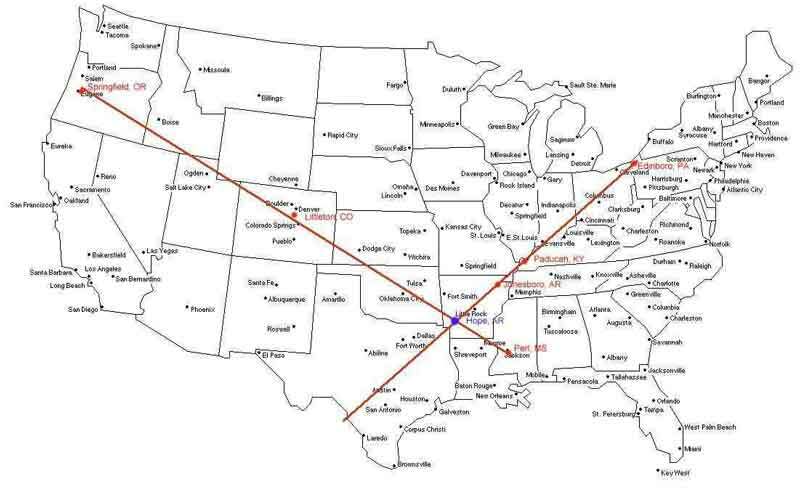 Since these lines center -- intersect -- in Hope, Arkansas, we can only conclude they are planned and carried out by the Clinton Administration. Finally, the only possible explanation for these school shootings to be carried out along these two upper lines of a Satanic Hexagram is to so anger the American people against guns they will rise up as one to demand all citizens give them up. Further, when we calculate the number of other disasters that have occurred on the lines of this hexagram, we truly are left with the high mathematical probability that Illuminist Witchcraft has likely been responsible for the disasters to occur during the Clinton Administration, so that his witchcraft goals -- which are the goals of the Illuminati -- can be furthered. Powerful Witchcraft is loose in this land, and is guiding this President during the course of his administration. We think it extremely instructive that God has led us on the investigative path He has, from the first moment we saw the original School Shooting Map, to right now. Truly, the time is short, and getting shorter, until the time when President Clinton will announce the planned multiple "crises" that are designed to panic us into the New World Order. We are extremely sobered by the realization that President Clinton may have been operating under this symbol from the very beginning of his administration. Time grows shorter by the day.